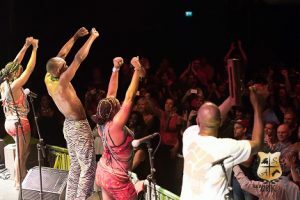 The last time Seun Kuti was in the city of Gothenburg was in August 2009 at the Way Out West festival. 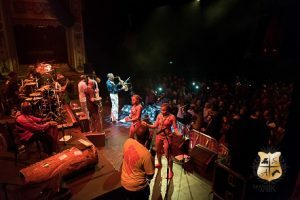 The youngest son of legend Afrobeat founder, Fela Anikulapo Kuti was at the Stora Teatern with the original band member of Egypt 80 to entertain the fans of the Afrobeat movement. 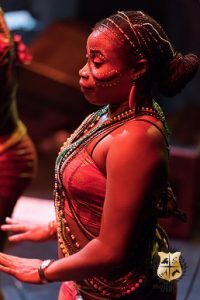 Keeping up the legacy of his late father and in line with Afrobeat music which is met for the ordinary people, Seun spoke about the political situation in Nigeria, his home country. The corruption and the recipient of the corrupt proceed which he called “International Mother Fucker “a name he derives from International Monetary Fund (IMF). He mentioned the insecurity of the African women by not embracing their natural beauty but rather want to get rid of their natural beauty by bleaching their skin colour. 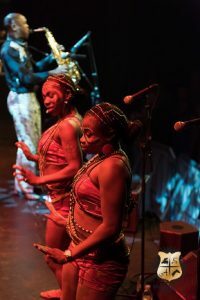 In a very impressive turn out at the concert, here are some of the pictures taken by Skandik Afrik crew at the scene.